It all seems like doome and glume,is there anything to look forward to.. Wait till they fix hubble, then we,ll see whats coming....i suppose? The crew of Atlantis bid farewell to the Hubble Space Telescope on behalf of NASA and the rest of the world Tuesday. The telescope was released back into space at 8:57 a.m. EDT. With its upgrades, the telescope should be able to see farther into the universe than ever before. Atlantis performed a final separation maneuver from the telescope at 9:28 a.m., which took the shuttle out of the vicinity of Hubble. The berthing mechanism to which Hubble has been attached during the mission was stored back down into the payload bay. The rest of the day was focused on the scheduled inspection of Atlantis’ heat shield, searching for any potential damage from orbital debris. The crew used the shuttle robotic arm to operate the Orbiter Boom Sensor System (OBSS) for the inspection. The crew worked ahead of schedule and returned the OBSS to the payload bay sill Tuesday instead of Wednesday. excellent link all about that trip which includes the space walk and stunning images. 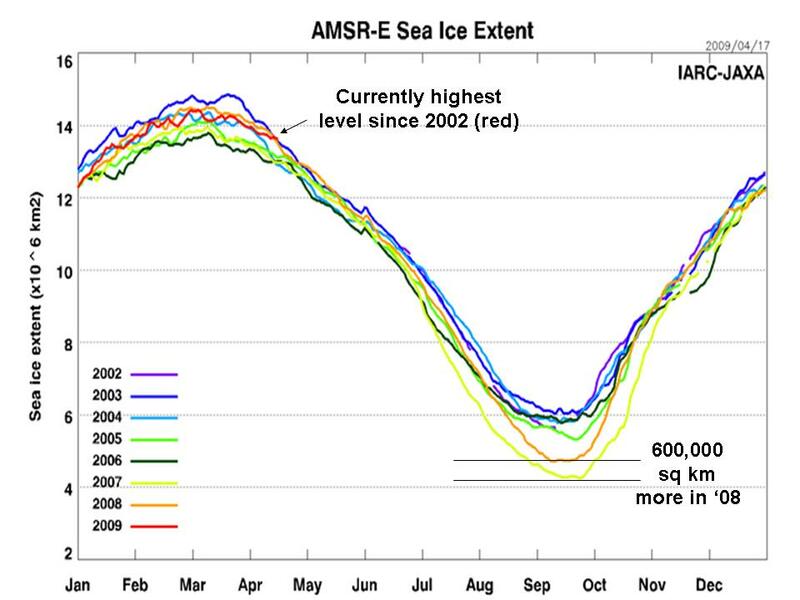 As for the ice, we hear in the media the hype about the arctic and Antarctic ice. 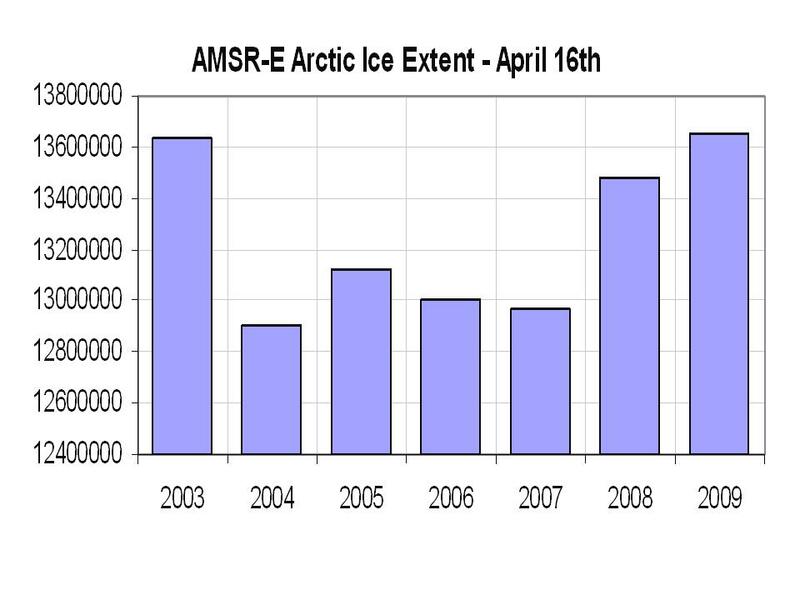 The arctic ice we are told is more first and second year ice and very vulnerable to a summer melt. Actually the arctic ice is the highest level since 2002,so are the low sunspot numbers having an influence in all of this???? I was worried about the few spots in the last few days,but this puts me at ease.Nice . Could the Sun play a greater role in recent climate change than has been believed? Climatologists had dismissed the idea and some solar scientists have been reticent about it because of its connections with those who those who deny climate change. But now the speculation has grown louder because of what is happening to our Sun. No living scientist has seen it behave this way. There is no sign of the Sun waking up. “This is the lowest we’ve ever seen. We thought we’d be out of it by now, but we’re not,” says Marc Hairston of the University of Texas. 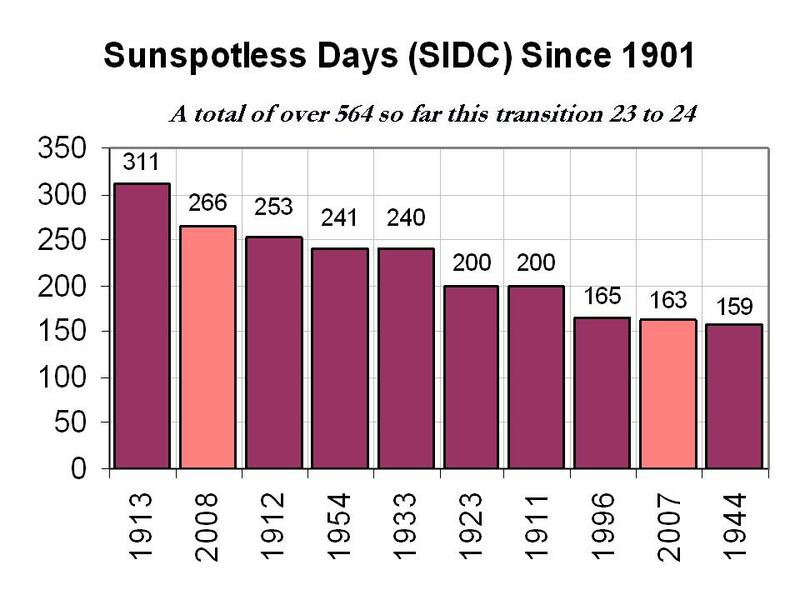 And it’s not just the sunspots that are causing concern. There is also the so-called solar wind – streams of particles the Sun pours out – that is at its weakest since records began. In addition, the Sun’s magnetic axis is tilted to an unusual degree. “This is the quietest Sun we’ve seen in almost a century,” says NASA solar scientist David Hathaway. But this is not just a scientific curiosity. It could affect everyone on Earth and force what for many is the unthinkable: a reappraisal of the science behind recent global warming. Our Sun is the primary force of the Earth’s climate system, driving atmospheric and oceanic circulation patterns. It lies behind every aspect of the Earth’s climate and is, of course, a key component of the greenhouse effect. But there is another factor to be considered. When the Sun has gone quiet like this before, it coincided with the earth cooling slightly and there is speculation that a similar thing could happen now. If so, it could alter all our predictions of climate change, and show that our understanding of climate change might not be anywhere near as good as we thought. Overall, during an 11-year solar cycle the Sun’s output changes by only 0.1 per cent, an amount considered by many to be too small a variation to change much on earth. But there is another way of looking it. While this 0.1 per cent variation is small as a percentage, in terms of absolute energy levels it is enormous, amounting to a highly significant 1.3 Watts of energy per square metre at the Earth. 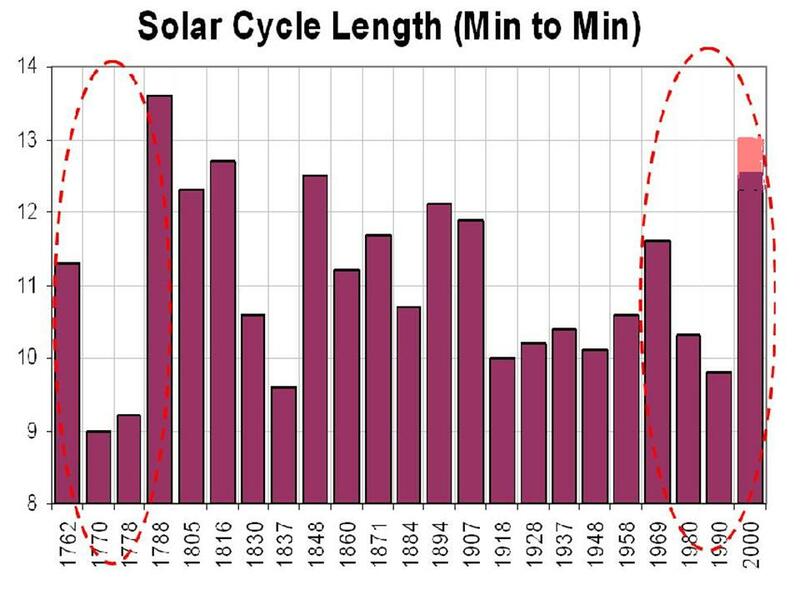 This means that during the solar cycle’s rising phase from solar minima to maxima, the Sun’s increasing brightness has the same climate-forcing effect as that from increasing atmospheric greenhouse gasses. There is recent research suggesting that solar variability can have a very strong regional climatic influence on Earth – in fact stronger than any man-made greenhouse effect across vast swathes of the Earth. And that could rewrite the rules. No one knows what will happen or how it will effect our understanding of climate change on Earth. If the Earth cools under a quiet Sun, then it may be an indication that the increase in the Sun’s activity since the Little Ice Age has been the dominant factor in global temperature rises. That would also mean that we have overestimated the sensitivity of the Earth’s atmosphere to an increase of carbon dioxide from the pre-industrial three parts per 10,000 by volume to today’s four parts per 10,000. Or the sun could compete with global warming, holding it back for a while. For now, all scientists can do, along with the rest of us, is to watch and wait. and i just couldn't resist posting this image.i feel it shows how fragile and thin our atmosphere really is.few nice storms too.solar flares would so easily do us harm if it were not for the earth's protective magnetic field. Typical Solar Min: 485 days would anyone like to hazard a guess when this will end? Last edited by Redsunset; 21-05-2009 at 21:17.
just for fun make sure these images of the spacewalk fixing of hubble are about 2 feet away from you.then cross your eyes,as in look through the screen.you should see the 3D effect as if you were there. But what it's waiting for is anyone guess. this is an excellent image that shows earth being protected by the magnetic field from those solar winds. notice little or no protection at our 2 poles.hence we see the northern lights. According to theory and observation, the speed of the belt foretells the intensity of sunspot activity ~20 years in the future. A slow belt means lower solar activity; a fast belt means stronger activity. We have something similar here on Earth—the Great Ocean Conveyor Belt, popularized in the sci-fi movie The Day After Tomorrow. It is a network of currents that carry water and heat from ocean to ocean. In the movie, the Conveyor Belt stopped and threw the world's weather into chaos. Last edited by Redsunset; 21-05-2009 at 23:03. I hope it lasts until there is at least some noticeable cooling. When was the last time the suns axis flipped this much btw? The link between increasing solar wind intensity and cancer has been shown in quite a few studies.Would cosmic rays be worse,given that our magnetic field is at its weakest in 300 yrs(apparently in preparation for a flip,according to a report I saw last year on BBC). well first nof all what are cosmic rays? Cosmic rays are tiny particles, mostly protons, that slam into the Earth's atmosphere at various levels of energy. Billions of cosmic rays are slamming into the Earth every second, most of them with a quite low energy. However, every once in a while cosmic rays with extreme levels of energy impact the Earth. The most powerful yet recorded was a single proton with an energy of 50 J, roughly equivalent to a baseball pitch. Scientists are at a loss to explain how some of the most energetic rays got their energy. Although they are called "cosmic rays," it should be noted that cosmic rays are point-like particles, not rays. Aside from protons, which make up 90% of all cosmic rays, there are also helium nuclei, also known as alpha particles, which make up another 9%, and electrons which make up the remaining 1%. Outer space is filled with a bath of fast-moving particles, known as the cosmic ray flux. Cosmic rays are called ionizing radiation because they have the tendency to impact molecules with such force that they knock the electrons off their constituent atoms, creating destructive ions. A piece of biomaterial left unprotected for long enough in the cosmic environment would turn into Swiss cheese. This is one of the greatest challenges for human space colonization, and all space colony designs feature massive shielding to repel cosmic rays. Cosmic rays get their oomph from high-energy cosmic objects and events, such as neutron stars, supernovae, and black holes. Most cosmic rays originate from within our own galaxy, where they are belched out by supernovae, or launched like a slingshot from the steep gravity well of a black hole. In fact, the presence of certain power levels of cosmic rays is evidence that black holes really exist. One of the highest levels of the Earth's atmosphere is known as the ionosphere, because it is constantly being ionized by incoming cosmic rays, along with solar radiation. The thermosphere, which is a subset of the ionosphere, experiences heating of up to thousands of degrees due to ionizing radiation, but because the particle density here is relatively low, it wouldn't feel that warm if you were to visit there. The most energetic cosmic rays come from super high-energy events outside our galaxy, and provide a rare window into the workings of the wider universe. Physicists build multi-million dollar facilities to study the cosmic ray flux in detail. They are everywhere, and several dozen slam into your body every second. These cosmic rays are too low-energy to cause any serious health effects, aside from a few genetic mutations, and cosmic rays are in fact one of the drivers of evolution. Your body receives about 2.4 mSv (milliSieverts) of radiation caused by the effects of cosmic rays every year. For comparison, it takes about 1 Sievert of radiation in a short time to cause nausea, and about 2-6 Sieverts to cause death. The health effects of cosmic rays change at higher altitudes, where the cosmic ray flux increases exponentially up to an altitude of about 15 km (9 mi), then drops off rapidly. Because of this, people who spend a lot of time at high altitudes, like airline pilots, stewardesses, and Air Force test pilots, experience dozens of times the effects of cosmic rays that people on the ground do. This is still well below the career limit of 1-4 Sv recommended by the National Council on Radiation Protection and Measurements. The cosmic ray flux is low enough in the Earth's atmosphere that exposure only becomes an issue in space. On the International Space Station, 350 km (217 mi) above the surface of the Earth, astronauts experience the effects of cosmic rays hundreds of times more numerous than those experienced by people on the ground. The Earth's atmosphere is such an effective insulator that barely any particles actually make it to the ground, and most of what people are exposed to is secondary radiation from collisions in the upper atmosphere. 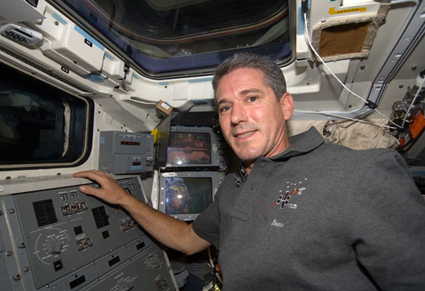 On space stations, astronauts are exposed to primary radiation. However, people have spent more than a year in space with no ill effects of cosmic rays, and it seems plausible that indefinitely long stays are possible. Then there's the burning question,Yes what about our weakening magnetic field? great article here on this and solar cycle24,maybe youv'e read it. New scientific discoveries are indicating that this next solar flare cycle could potentially be powerful enough to distrupt our planet's entire electric grid. In this report, I will document the number of changes taking place with our magnetic field, the sun and our solar system while expaining some of the concerns that today's leading scientists have voiced. I will also be examining how humankind may also be affected energically. TV, cell phone towers, power lines, and house appliances—while they make lives more convenient for some, they also contribute to polluting our electromagnetic atmosphere. A growing number of scientists, health care professionals, and concerned citizens argue that these invisible frequencies are responsible for a host of various health problems. Meanwhile, the largest polluter has gone unnoticed: the sun. And it's about to fire up again. The magnetosphere is a bubble of magnetism that surrounds Earth and protects us from solar wind. Fortunately, our planet's magnetic field diverts most particles into a circular path around the Earth. Like weather patterns found on Earth, solar wind patterns can change rapidly. Luckily, our planet's magnetosphere quickly responds to the threat and absorbs the impact, wiggling and jiggling in the process. Geophysicists call this reaction a geomagnetic storm, but because of how it disrupts the Earth's magnetic field, it could also be called electromagnetic pollution. This is when we see the Aurora Borealis in our night skys. The Earth's magnetic field has been decreasing. 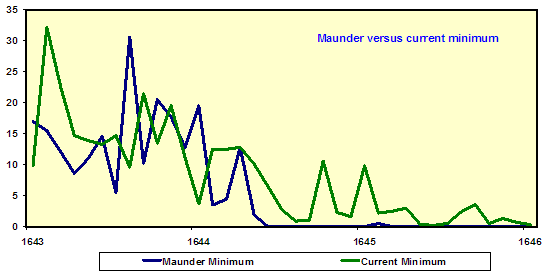 This decrease actually began 2000 years ago, but the rate of decrease suddenly became much more rapid 500 years ago. Now, in the last 20 years or so, the magnetic field has become erratic. Aeronautical maps of the world — which are used to allow airplanes to land using automatic pilot systems — have had to be revised worldwide in order for the automatic pilot systems to work. NASA's five THEMIS spacecraft have discovered a breach in Earth's magnetic field ten times larger than anything previously thought to exist. When this happens, solar wind can flow in through the opening to "load up" the magnetosphere for powerful geomagnetic storms. Exploring the mystery is a key goal of the THEMIS mission, launched in February 2007. "At first I didn't believe it," says THEMIS project scientist David Sibeck of the Goddard Space Flight Center. "This finding fundamentally alters our understanding of the solar wind-magnetosphere interaction." "The opening was huge—four times wider than Earth itself," says Wenhui Li, a space physicist at the University of New Hampshire who has been analyzing the data. Li's colleague Jimmy Raeder, also of New Hampshire, says "1027 particles per second were flowing into the magnetosphere—that's a 1 followed by 27 zeros. This kind of influx is an order of magnitude greater than what we thought was possible." The size of the breach shocked researchers. "We've seen things like this before," says Li's colleague Jimmy Raeder, "but never on such a large scale. The entire day-side of the magnetosphere was open to the solar wind. This is changing our understanding of the universe. Space physicists have long believed that holes in Earth's magnetosphere open only in response to solar magnetic fields that point south. The great breach of June 2007, however, opened in response to a solar magnetic field that pointed north. To the lay person, this may sound like a quibble, but to a space physicist, it is almost seismic. It means that something is happening out there that they didn't predict and that is what has them frightened. Here is where the scientific understanding our how magnetic field is changing: What is understood today in the scientific community is that the solar wind presses against the Earth's magnetosphere almost directly above the equator where our planet's magnetic field points north. Scientists previously believed that if a bundle of solar magnetism came along, and points north, too, the two fields should reinforce one another strengthening Earth's magnetic defenses and slamming the door shut on the solar wind. In the language of space physics, a north-pointing solar magnetic field is called a "northern IMF" and it is synonymous with shields up. The big suprise is that when a northern IMF came along, the shields went down. This is completely overturning many scientists understanding of things. As Researchers investigated the tear in the magnetic field, they discovered that twenty times more solar wind passed into the Earth's protective shield when the magnetic fields were aligned. Northern IMF events don't actually trigger geomagnetic storms, notes Raeder, but they do set the stage for storms by loading the magnetosphere with plasma. A loaded magnetosphere is primed for auroras, power outages, and other disturbances that can result when a CME (coronal mass ejection) hits. This means the impact of sloar flares are twenty times as strong with the magnetic lines are aligned. Earth's and the sun's magnetic fields will be in sync at the solar cycle's peak, expected in 2012. This will cause an influx of solar particles. What the scientists didn’t discuss is the impact on the human bioelectrical system. The earth's climate has been significantly affected by the planet's magnetic field, according to a Danish study published in January 2009 that could challenge the notion that human emissions are responsible for global warming. The results of the study, which has also been published in US scientific journal Geology, lend support to a controversial theory published a decade ago by Danish astrophysicist Henrik Svensmark, who claimed the climate was highly influenced by galactic cosmic ray (GCR) particles penetrating the earth's atmosphere. As liquid metal passes through the stronger field, more current flows, which increases the field still further. This self-sustaining loop is known as the geomagnetic dynamo. Material from the liquid outer core slowly "freezes" onto the inner core, releasing heat as it does so. (High pressures within the Earth cause material to freeze at high temperatures.) This heat drives convection cells within the liquid core, which keeps the liquid metal moving through the magnetic field. Energy is needed to keep the dynamo running. This energy comes from the release of heat from the surface of the solid inner core. Our planet's spinning motion causes the moving liquid metal to spiral, in a way similar to how it affects weather systems on the Earth's surface. These spiraling eddies allow separate magnetic fields to align and combine forces. The changes "may suggest the possibility of an upcoming reversal of the geomagnetic field," said study co-author Mioara Mandea, a scientist at the German Research Centre for Geosciences in Potsdam. Earth's magnetic field has reversed hundreds of times over the past billion years, and the process could take thousands of years to complete. "This is a big discovery," says co-author John Wefel of Louisiana State University. "It's the first time we've seen a discrete source of accelerated cosmic rays standing out from the general galactic background." To study the most powerful and interesting cosmic rays, Wefel and colleagues have spent the last eight years flying a series of balloons through the stratosphere over Antarctica. Their NASA-funded cosmic ray detector found an significant surplus of high-energy electrons. "The source of these exotic electrons must be relatively close to the solar system—no more than a kiloparsec away," says co-author Jim Adams of the NASA Marshall Space Flight Center. Galactic cosmic rays are subatomic particles accelerated to almost light speed by distant supernova explosions and other violent events. They swarm through the Milky Way, forming a haze of high energy particles that enter the solar system from all directions. Cosmic rays consist mostly of protons and heavier atomic nuclei with a dash of electrons and photons spicing the mix. Why must the source be nearby? Adams explains: "High-energy electrons lose energy rapidly as they fly through the galaxy. They give up energy in two main ways: (1) when they collide with lower-energy photons, a process called inverse Compton scattering, and (2) when they radiate away some of their energy by spiraling through the galaxy's magnetic field." High-energy electrons are therefore local but the researches cannot pinpoint the source in the sky. The sun is a massive electromagnetic broadcaster which floods the planets of the solar system with heat, light, UV radiation, and electrically charged particles. The Sun itself has a magnetic field, and that magnetic field creates an "egg" around the Solar System that is known as the "heliosphere." The heliosphere is shaped like a teardrop, with the long, thin end of the drop pointing away from the direction in which we're traveling. 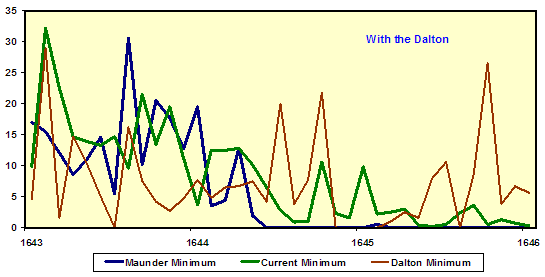 Some of the sunspot activity in this last cycle was greater than anything ever recorded before in history. But scientists claim that they don't understand what means either. "Obviously, the sun is Earth's life blood," said Richard Fisher, director of the Heliophysics division at NASA. "To mitigate possible public safety issues, it is vital that we better understand extreme space weather events caused by the sun's activity." Thats almost all there is to know about cosmic rays .I was just asking that now with the weak solar wind their effect will be more than the "solar" cosmic rays,will our weakening field hold out. Interesting stuff about the magnetic field though.I had not heard about the probes flying through the breach.Guess were pretty vulnerable already. I would love to see Al Gores face if this calm lasts about 6 months more.It would be an "inconvenient" calm for him .